In September 2012, Esri hosted the WWW Conference, a world-class event featuring artists, entertainers, scientists, and visionary thinkers coming together to reinvent "the art of conversation." It was a hot-ticket item with a select audience fortunate enough to attend. Now the experience has been made accessible to all. Esri has provided Esri International User Conference (Esri UC) attendees with free access to the more than 30 pairings of brilliant minds from the conference through the WWW Conference app for iPad and iPad Mini. People can easily revisit the extraordinary conversations and—moreover—exclusive material, such as new videos of Pritzker Prize-winning architect Frank Gehry and hand-edited drafts from Pulitzer Prize-winning poet C. K. Williams. A treasure trove of illustrations, cartographic images, and bibliographic references is available for anyone to delve deep into the resonating ideas and personal histories of WWW conference participants. Richard Saul Wurman—architect, cartographer, and founder of the renowned Technology/Entertainment/ Design (TED) conferences—developed the WWW Conference to give attendees riveting, uncut, and unrehearsed discussions that "seduce and inspire," according to the former Esri UC keynote speaker and author of more than 80 books. 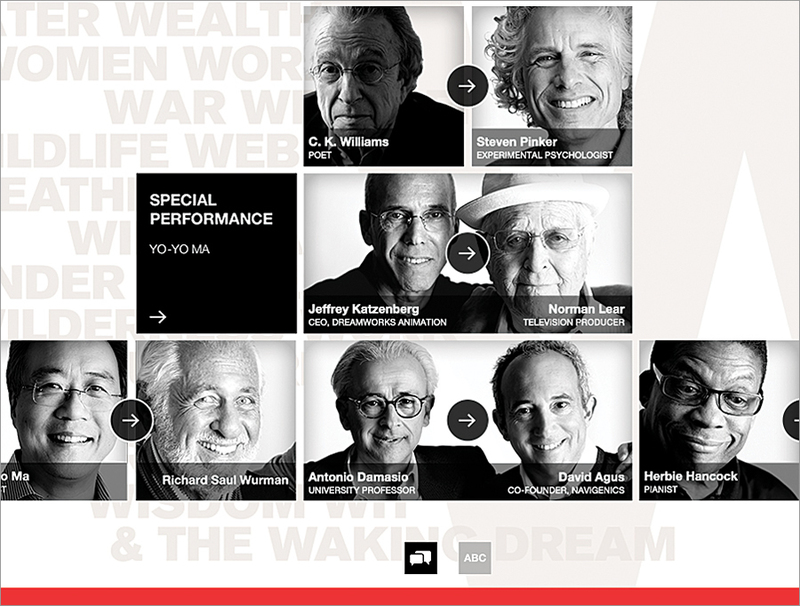 "In its great leap backwards, starting with Plato, Socrates, and Aristotle, all of whom were involved in the celebration of conversation 2,500 years ago, the conference engaged in the intimacy a single conversation can offer," says Wurman, who created the forum as the anticonference to engage improvised conversation—intellectual jazz. Indeed, the conference was lauded for its natural, organic staging and passionate exchanges. Forbes contributor Dan Munro wrote, "Much of the real creativity for the conference was in the format itself. . . . An intimate venue, a single host, two people and one audience." Thomas Fisher, dean of the College of Design at the University of Minnesota, wrote in The Huffington Post, "All of [the speakers] seemed to share one trait; the relentless pursuit of a big idea or passion, regardless of what their colleagues or critics thought." The WWW app showcases the intimacy of the individual and the power of the idea through its elegant filming and presentation style. Choose a conversation, speaker details, or supplemental material—it's all available in an intuitive mobile environment. Now available in iTunes, the app is free for Esri UC attendees or can be purchased for US$3.99. Selecting the first letter of a speaker's first or last name in the interactive alphabet allows you to begin learning about those that participated in the conference. In the final quarter of 2013, the app will undergo a massive update. More material will be added to enhance the depth of the unique experience and will only be accessible through the app. As the year progresses, more speaker contributions will be included in a major update.